Feature packed and more reliable than a satellite phone. 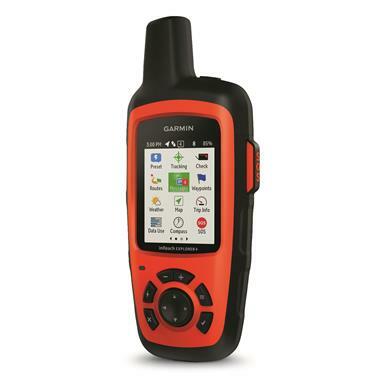 Turn to the inReach Explorer+ Satellite Communicator when you need a reliable backup plan when out of cell phone range. This handheld satellite Communicator is designed for the outdoor enthusiast who wants to drop off the face of the earth, but NOT without a trace in a dire situation. From backcountry experiences to remote international adventures, inReach provides communication, location sharing, navigation and critical SOS functions for anyone who loves getting away from it all. Plus, the tough, impact-resistant unit is water-rated to IPX7 to keep up with your wanderlust. Using the worldwide coverage of the Iridium satellite network, this go-anywhere portable device lets you exchange text messages with any cell phone number or email address from anywhere. Or use the GPS to track and share your journey’s progress. You can also post to social media, or even communicate inReach-to-inReach while in the field. In case of an at-risk situation, you can trigger an SOS distress signal to a monitoring center, text back and forth about the nature of your emergency, and receive confirmation when help is on the way. And no worry if you're not within range of a cell tower. inReach works anywhere and everywhere—so you’re never out of range. Turn on the tracking function and let family and friends follow your progress from a computer or mobile devices. inReach sends waypoints at preselected time intervals, so followers can track your whereabouts using the web-based MapShareTM portal. Plus, get GPS on-map guidance with preloaded TOPO mapping and waypoint routings viewable directly on the unit. The device also has a built-in digital compass, barometric altimeter and accelerometer to help you maintain accurate bearings while off the beaten path. For even more capability, use the free Earthmate® app to sync it via Bluetooth® with a compatible Apple® or AndroidTM device to access unlimited maps, aerial imagery and U.S. NOAA charts. Note: DeLorme TOPO maps are not compatible with other Garmin devices. Other Garmin maps not compatible with this device.